Tired of the poor running condition, rich idle, stumble off idle, poor fuel economy, general lack of power of your Y-Block? MSD and Mallory units are too obtrusive and don't fit properly in your Baby Bird? The SOLUTION!........... Keep it Looking Ford! ......R.I.P. Henry, we got you covered! Today's fuel formulations requires that your Y-Block use both Mechanical & Vacuum Advance, they just can't burn today's fuel without both! I think you'll agree that fuel quality is not going to get any better in the future so we need to think down the road to preserve our American Classics. These distributors feature a lower bearing to stabilize the lower shaft and keep the shaft running true to the Ford blocks, No More points to change, No More shaft wobble, OEM Ford finish for stock appearance, No Ballast resistor required, Simple 2 wire hook-up. NO External Box! Now you'll have a dependable 40KV going to the plugs on demand to ignite and burn today's so called gas..... I call it camel spit. Includes Fully set-up phased and curved NEW Distributor, Ignitor III Coil and REV Limiter for safety. Multi Spark throughout the full RPM Range, not just to 3000 RPM REV Limiter set to your RPM spec. These Distributors have controlled Mechanical Advance curve and Vacuum Advance Limiters for optimum fuel economy and performance whether your Y-Block is stock or performance application. This distributor upgrade brings your classic Ford Y-Blocks ignition into this century, enabling it to achieve good fuel economy, maximum power and still run on current and future modern fuel formulations. Today's fuel is formulated to burn in the very hot combustion chamber environment of new lean burn emissions engines. We can't duplicate the design efficiency of a 32V injected and computer controlled combustion chamber with our Y-Block cylinder heads but we can sure help it keep up. The original Y-Blocks had a very poor Mechanical and Vacuum advance system one or the other and some had none! Even Ford new this and tried several combinations and when the FE Motors were released one of the features was a Vacuum and Mechanical advance distributor for "Greater Fuel Economy and Performance"
We've stepped up even further and using today's technology and incorporating it into a distributor that fits in your Y-Block with no modifications and connects simply with 2 wires.... Simple, Efficient, Reliable, simple to install with outstanding results that you'll hear, see and feel as soon as you turn the key and step on the loud peddle! Compare to MSD 83831 with a coil at $429.00 now add the 6AL box at $240.00 it still needs to be set up by a experienced Technician costing another $125.00 and a NON-Emissions adjustable Vacuum Canister installed but the question remains..... will MSD and the Chinese knock offs fit? Do you really want that billet distributor in your classic? Will your plug wires work with their cap? By the time your done with set-up and ordering all the components to get the equivalent to the FBO Complete distributor you'll be into that red beast for well over $800. Can you guess where it's made? Yup, comes in folding waxed box with a fortune cookie.... Now look at their warranty, call them for tech help you'll see the difference. These distributors are not an off the shelf imported "one size fits all" each one is custom built to not only fit your Y-Block but all elements are considered in the set-up and curve to optimize the performance of your engine. Detonation free, best fuel economy and power. We (there's just 2 of us old guys) take care to make sure everything is correct and take the time to rigorously test each distributor to ensure perfection, we take pride in our products and apply over 100 years of combined experience to ensure you get the best product we can build each and every time. Mediocrity is just not in our vocabulary, perfection is our business standard. Better product, better warranty, better tech support, better appearance and American Made .... everything you want and should demand for your hard earned money. This is a custom built product that requires time in our machine shop and distributor shop please allow us 10-14 days to ship. Today's fuel formulations demand that the complete ignition system be upgraded, unless you have a source on 1957 leaded fuel and if you want it to run properly and last a few years. If anything has been changed in the induction system (carb, heads, headers, intake) those old obsolete distributors will not run today's fuel, even if it's all original it won't be able to burn the fuel. Ford was well aware of the issues of these distributors and they were discontinued with the updated FE Engine that ran both mechanical and vacuum based distributors. Don't waste your time and money trying to rebuild any of those Y-Block distributors and expect them to run properly ****UPGRADE*** to this century. Early Y-Block distributors were vacuum only units referred to as Load-o-matic. These distributors picked up a vacuum signal from the carburetor and varied advance based on engine demand. The Load-o-matic distributors will not work with modified or OEM stock engines! Usually the early distributors have metal tags to identify the part number. When the cap is removed the advance springs are visible. These distributors were used from 1954-1956. 1956 4bbl. cars used a dual diaphragm advance unit. Beginning in 1957 centrifugal advance was added. The body of the distributor is thicker and the springs are no longer visible with the cap removed. The rotor can be turned and will then spring back to it's static position. Part numbers are stamped into the body . These distributors used a full diameter breaker plate which rotates on ball bearings. The vacuum advance arm is straight. 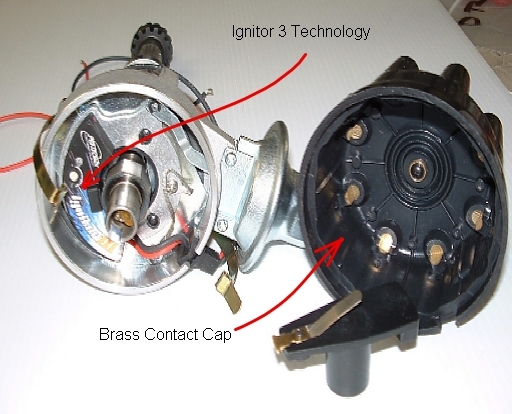 Points, cap and rotor will not interchange with the '54-'56 distributors. 12127 is the identifier for a distributor. The last two digits indicate actual application. Only Y-blocks use a 13 tooth cam gear. Part # 83831 MSD Distributor that fits some Y-Blocks without beating the firewall seam with a hammer. Standard Ford OEM diameter cap and body Nearly 7/8" of an inch shorter than MSD. No Clearance issues. Will fit in 55-57 T-Birds! Summit "We offer a 90-day Handshake Guarantee"
Tech Support Can you get hold of anyone who knows Y-Blocks...Good Luck if you can find anybody who even knows what a Y-Block is? $15.00 Best Tech Support in the industry. 100 combined years of setting up distributors for all makes and applications I'm almost always available during reasonable hours, even on weekends if your in a jam. You can also just text me and I'll answer as quick as possible. Custom Curve and Phased Not Available from MSD... Supposedly "THE" Distributor Company?... Says Who? $? Not available Fully custom Curved/Phased to your specs with mechanical and vacuum advance limiters installed. Between the 2 of us we back our products and workmanship with over 100 years hands on experience. $249.95 YES: integrated in the PTX III module. Accurate to +/- 50 RPM. Easily adjustable We set the rev limiter as part of our set-up service. Better Product, Better Fit, Better Tech Support, More reliable, Lower cost by Over $300, More features & with a unbelievable..
Chinese knock off's WHY? 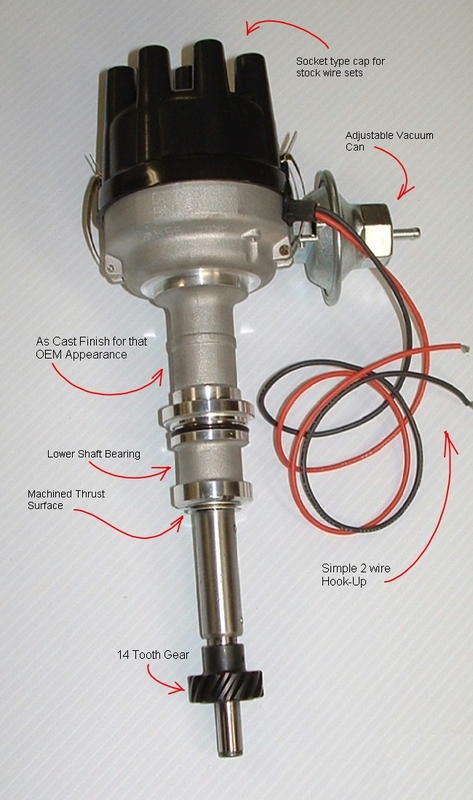 would you even consider using a low quality, poor performing with No tech help or parts available distributor in your classic early Y-Block Ford? When you start installing those low grade Chinese parts you might as well just bolt in a 350 Chevy/350 trans and a 3.50 gear and build a belly button car. Do you really want that Chinese distributor with Chevy cap starring at you every time you open your hood.... call me a purest but it would be way to embarrassing for me. We will not work on the Chinese Import fake distributors, no repairs, no set-up or curving and we have no parts for them. In this industry the last guy to work on it is responsible for it... we will not take responsibility for tech information or be a warranty dump for Imported low quality products.